"Laois" redirects here. For other uses, see Laois (disambiguation). County Laois (/ˈliːʃ/ LEESH; Irish: Contae Laoise) is a county in Ireland. It is located in the south of the Midlands Region and is also located in the province of Leinster, and was formerly known as Queen's County. The modern county takes its name from Loígis, a medieval kingdom. Laois County Council is the local authority for the county. The population of the county is 80,559, according to the 2011 census - 20% higher than it was in the 2006 census, which is the highest percentage of population growth in the country. By the first century AD, the western third of Laois was part of the Kingdom of Ossory. 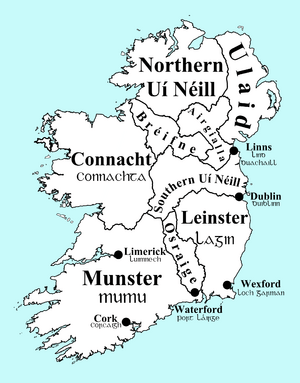 The eastern part was divided roughly into seven parts, which were ruled by the Seven Septs of Loígis: O’More (O’Moore), O’Lalor, O’Doran, O’Dowling, O’Devoy (O’Deevy), O’Kelly and McEvoy. Map of Ireland around 900 AD. The western third of Laois was part of the Kingdom of Osraige. When Ireland was Christianized, holy men and women founded religious communities in Loígis. St. Ciarán of Saighir (called "The Elder" to distinguish him from the younger St. Ciarán of Clonmacnoise) founded his monastic habitation in the western Slieve Bloom Mountains as the first bishop of Ossory, reputedly before St. Patrick. His mother Liadán had an early convent nearby at what is now Killyon. 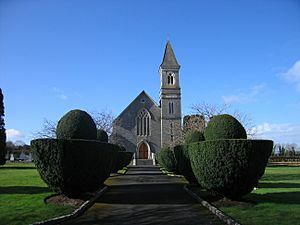 Between 550 and 600, St. Canice founded Aghaboe Abbey and St. Mochua founded a religious community at Timahoe. An early Christian community lived at Dun Masc or Masc’s fort, on the Rock of Dunamase. From 1175 until about 1325, Normans controlled the best land in the county, while Gaelic society retreated to the bogs, forests and the Slieve Bloom Mountains. The early 14th century saw a Gaelic revival, as the chieftains of Loígis caused the Normans to withdraw. 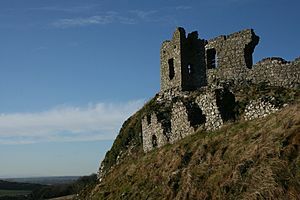 The Dempseys seized Lea Castle, while Dunamase came into the ownership of the O’Mores. Examples of tower houses built by the Irish Mac Giolla Phádraig chieftains are found at Ballaghmore and Cullahill Castle, both decorated with Sheela na gigs. In 1548, the English confiscated the lands of the O’Mores, and built "Campa," known as the Fort of Leix, today’s Portlaoise. It was shired in 1556 by Queen Mary as Queen's County, covering the countries of Leix (Loígis), Slewmarge, Irry, and that part of Glimnaliry on the southwest side of the River Barrow. 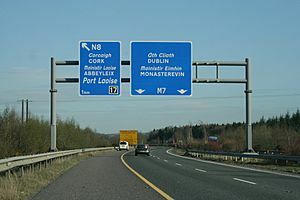 Laois received its present Irish language name following the Irish War of Independence. Laois was also sometimes spelt "Leix". Portlaoise (previously Maryborough) is the county town. Loígis was the subject of two Plantations or colonisations by a mix of Scottish and English settlers. There was a more successful plantation in the county in the 17th century, which expanded the existing Scottish and English settlement with more landowners and tenants from both Scotland and England. Neither plantation was fully successful due to a lack of tenants and because of continuous raids and attacks by the O'Moores. The county was formerly known as Queen's County (Irish: Contae na Banríona) until its name was informally changed on establishment of the Irish Free State in 1922. The county's name was formerly spelt as Laoighis and Leix. Despite the county's name being upheld as Laois through the 2001 Local Government Act, no legislation was ever enacted after independence explicitly changing the name from Queen's County, the name formally established under the 1898 Local Government Act which continued to have legal effect. When land is sold in the county the relevant title deeds are still updated as being in Queen's County. Laois is the 23rd largest of Ireland’s 32 counties in area and also has the 23rd largest population. It is the seventh largest of Leinster’s 12 counties in size and tenth largest in population. The county is landlocked and, uniquely, does not border any other county which touches the coast. This is known as being doubly landlocked. It is therefore considered to be "the most landlocked county in Ireland". For climatological information please visit: durrow.ie for averages and extremes. Also County Laois has a mixture of castles, mansions, forts and old structures that are now in ruins but are still worth visiting. Mark Doheny (1982 - ),Comedian. Robert Sheehan (1988- ), actor best known for playing Nathan Young on E4's comedy drama, Misfits. Zach Tuohy (1989-), professional Australian rules footballer, currently playing for Carlton Football Club. Colm Begley (1986-), Gaelic football player. He played Australian rules football for the Brisbane Lions in the AFL. Professor Noel Fitzpatrick (1967-), Veterinary Surgeon for Channel 4 television series The Supervet. County Laois Facts for Kids. Kiddle Encyclopedia.